Integral sound healing is a non-invasive solution for muscle tensions, chronic pain, the effects of a stroke and many more physical, emotional and mental health challenges. Integral sound healing is very effective at triggering the relaxation response, which counters the many symptoms of chronic stress, including heart, endocrine and digestive disorders. Sound healing instruments can be applied both on-the-body and off-the-body, using a variety of easy-to-play instruments and voice. When instruments, such as tuning forks and singing bowls are played on the body, it is a form of local vibration therapy. The instruments can be applied by anyone with some training for self-care, and for working with family and friends in the home. 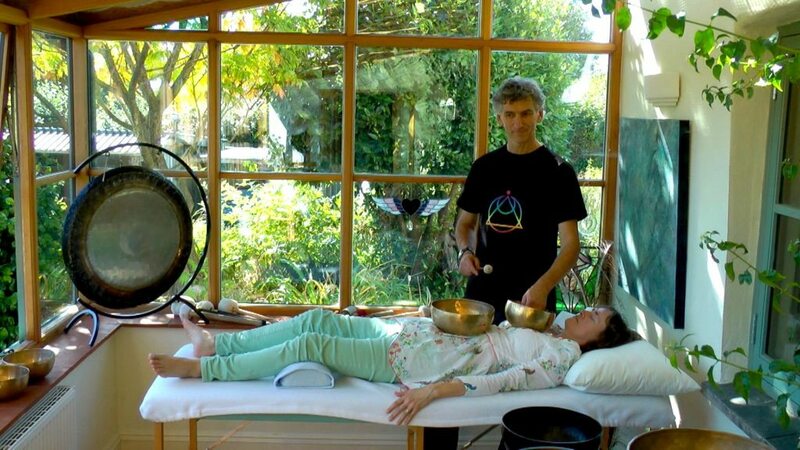 For best results, integral sound healing is practiced by certified practitioners with professional indemnity insurance. Training in Integral Sound Healing is uniquely provided by the Sound Healing Academy. Permanent results can be achieved, especially in the fields of physiotherapy, occupational therapy, speech and language therapy and naturopathy. Frequent application areas are the treatment of chronic muscle, joint and tendon diseases such as arthritis, tennis elbow, heel spur and myalgia. In the neuro-rehabilitation sector, spasticity, neglect, voice and swallowing disorders can be treated. In the pain therapy field, sound healing can be used for phantom pain, tensions, trigger points and joint pains. The sound vibrations of the sound healing instruments penetrate deep into the tissue. This improves blood circulation and metabolism, regulates muscle tension and deeply stimulates the tissue. Moreover, regeneration and repair mechanisms are stimulated. Sound healing is both activating and relaxing – so it also has a refreshing effect. The frequency of sound waves is measured in Hertz with 1 wave oscillation per second being 1 Hertz (Hz). Intrasound is the range of sound frequencies which we can hear. Sound healing instruments and our voice use a specific part of the intrasound range which has been found to have the optimum frequency to create the ideal resonance in human tissue. When intrasound waves reach molecules, which make up the cells of human tissue, each molecule absorbs a small amount of energy and then passes the wave on to the next molecule. This ripple effect continues until all the waves’ energy has been absorbed. When molecules are hit by sound waves close to their inherent frequency they will oscillate or strongly ‘resonate’. The many different molecules in human tissue have different inherent frequencies. Sound healing instruments generate sound waves which create this resonance effect across a wide spectrum of body tissue. This makes Integral Sound Healing so unique and effective. Sound vibration pulses are conducted through the connective tissue, blood, lymph and spinal fluids, cartilage, muscle tissue and bone with significant therapeutic consequences, particularly in the treatment of joints. How does this facilitate better health and wellness? The oscillation, or resonance, of molecules, triggered by the sound vibrations cause alternating compression and relaxation of cells. It is, in effect, a form of massage at a cellular level deep within the tissue undergoing the treatment. How do Infrasound, Intrasound and Ultrasound Waves Compare? Infrasound waves are also used in medicine for treatment, such as lithotripsy (breaking up kidney stones). Intrasound waves are perfectly safe for home and practitioner use. These waves can stimulate the body tissue but are not strong enough to heat or destroy tissue. Do not use sound healing instruments on the body during pregnancy, especially during the first 12 weeks. Do not use if you suffer from epilepsy. Please consult your doctor to ensure you receive the right anti-epileptic medication and are in no danger of seizure from sound vibrations. on any deep vein thrombosis in the leg or known thrombi. on acute inflammations and tumours. directly on or above a pacemaker or defibrillator. Keep a distance of at least 20 cm from where it is implanted. directly on or anywhere in the immediate area of a metallic implant. post surgery before the sutures have been removed and the scar is not fully healed and closed. around the neck in case of carotid atherosclerosis. Vibrational sound healing can be effective as a supporting measure for serious illnesses, however it does not replace a visit to the doctor. Ideally, its application should be arranged with the treating doctor or therapist. Sound healing instruments can also be used in compliance with the symptom: placed directly on or in the immediate vicinity of the aching area, on the antagonistic muscle and/or the antagonistic tendon, on trigger points near the aching area (or even acupuncture points), or contralateral to the aching area. In this sense sound healing can be compared to local vibration therapy. The deep penetrative effect of sound wave treatment can be attained by both direct application to the bone and to relatively soft tissue. Sound healing instruments are passed over or around the area to be treated using a variety of techniques: pressure on points; linear strokes, tapping, circular and spiral motions. Unless otherwise prescribed, treatment can be carried out twice a day (or more often if necessary) for a duration of between 10 & 30 minutes. The duration of the application can be reduced when treating sensitive or very sore parts of the body. The instruments do not have to be used on bare skin. Textiles have a negligible influence on the deep penetrative effect. Sound healing instruments are exceptionally well-suited to wellness applications such as relaxing full-body massages, invigorating foot and leg massages, and soothing face massages. For sustainable results the treatments should be carried out daily; or even multiple times per day, e.g. mornings and evenings.